Charming new Villa with Pool, A/C , close to beaches and cities, all comfort! This characteristic stone-built farmhouse has been recently restored to the highest standard and converted into a comfortable modern villa. 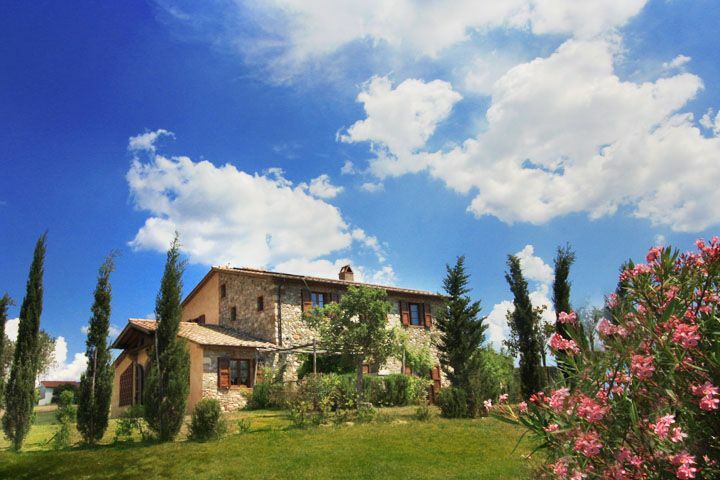 The villa offers an ideal location to visit the most famous Tuscan cities and beaches! Many famous cities are within a 1 hour drive: Pisa 45 km, Volterra 30 km, San Gimignano 45 km, Florence 100 km, Siena 80 km. Closest Village is 2 km away and is accessible also by bike. The villa, surrounded by cultivated fields, features a large beautiful pool and a loggia for dining al fresco with wonderful views of the gentle rolling hills that extend as far as the sea. The garden is fully equipped and a large porch include barbecue. I spent a pleasant holiday in this villa together with a group of friends. It is the second time that we organize a trip all together, but it is the first time that we have decided to go abroad. My girlfriend had seen on the internet photos of this beautiful villa. The photos can not even express how beautiful it is. For what we imagined of Italy (many of us had never been there before) in fact it has a very "Tuscan countryside" viber that made us feel immediately at home. What conquered us at first sight, however, is the swimming pool, fantastic, big and all for us. Since that there is a nice veranda with table and chairs, we also took advantage of it to eat outside in the evening, during the sunset. The view is really impressive! We were pleased with our choice and the service of Villa & Charme! To next year! The holiday in this villa was something simply unique. The villa itself is magnificent: very elegant, spacious, clean, equipped with everything. The garden is well-kept and huge. The pool is, of course, the fundamental point of the estate. Large and equipped with umbrellas and sunbeds on the poolside and also a gazebo, you can spend pleasant days, lazy on deckchairs to sip a frozen drink, next to the pool. If I think back to last summer ... how much nostalgia, I would like to be there right now! Villa with EVERYTHING! Great stay! A wonderful villa that we will never forget. The pool area surrounding them are beautiful and very large. you can spend a day at the pool together quietly, given the spaces. The rooms are spacious and well furnished, the kitchen is beautiful, even with the oven to make pizza, like real Italians. a 10 and praise stay. I thank the staff of Villa & Charme for this experience! A group of 10 of us booked Villa Poggio di Castellina for a week at the beginning of August. We had three families with two children and there was something for everyone. First, the Villa and property are beautiful. The bedrooms are spacious, the dining room could hold all of us and the safe pool was a great way to relax. Second, the location is fantastic. Villa Il Poggio di Castellina is just a few minutes driving to the town of Castellina Marittima. Additionally, the location is within an hour drive from Florence,Pisa and Cinque Terre. All great day trips. Finally, I can't say enough about the house manager, Sabrina. She was extremely helpful before we arrived, answering all the questions we had and helping us arrange anything we needed. She arranged a Dinner for us at the property and also gave us great advice and logistics. I would recommend this property to anyone! I spent two weeks in this wonderful villa set in the Tuscan countryside: it truly is a beauty spot in an already suggestive land. I loved not only the style of this villa, rural and modern at the same time, but also the location: the villa is situated in a peaceful place at the same time far from the noise of the city but close to many wonderful villages like Volterra and San Gimignano (around 30-40 minutes by car) and other famous cities, as Pisa and Florence. If it is needed anything, the closest village is about 3 km far. The white sandy beaches of Cecina and Vada are just 5 km. The villa is spacious and cosy thanks to its homely atmosphere. We were a group with some children and they enjoyed the place as much as we adults, especially the swimming pool. I recommend this place if you’ve never been to Tuscan. This is the perfect location where to start from: it gives you both the taste of the country vibes and in few kilometres you can satisfy the knowledge of the Italian cities culture.